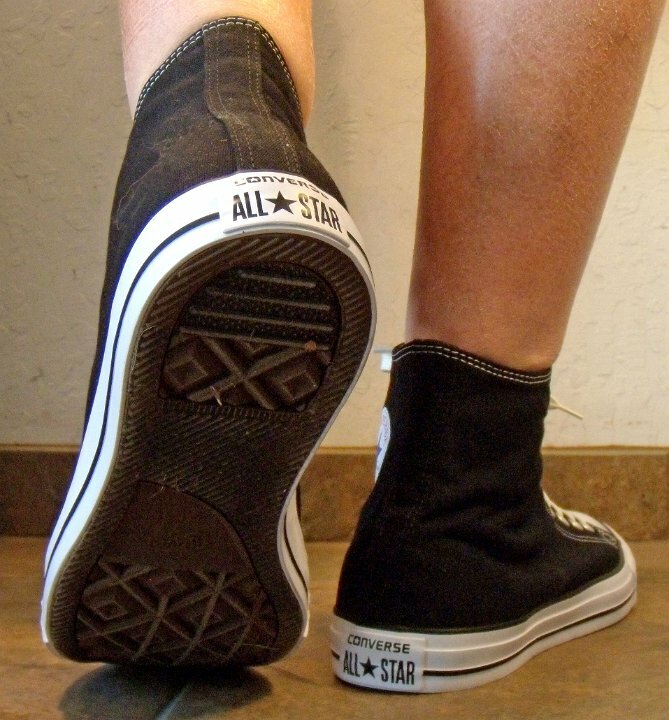 Photo gallery of a pair of 2018 Black High Top Converse Chuck Taylor All Stars. 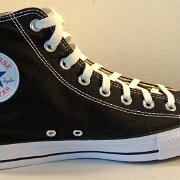 1 2018 Black High Top Chucks Outside view of the black right high top. 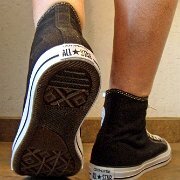 2 2018 Black High Top Chucks Inside patch view of the black right high top. 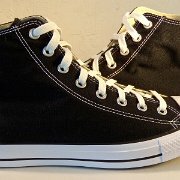 3 2018 Black High Top Chucks Outside view of the black left high top. 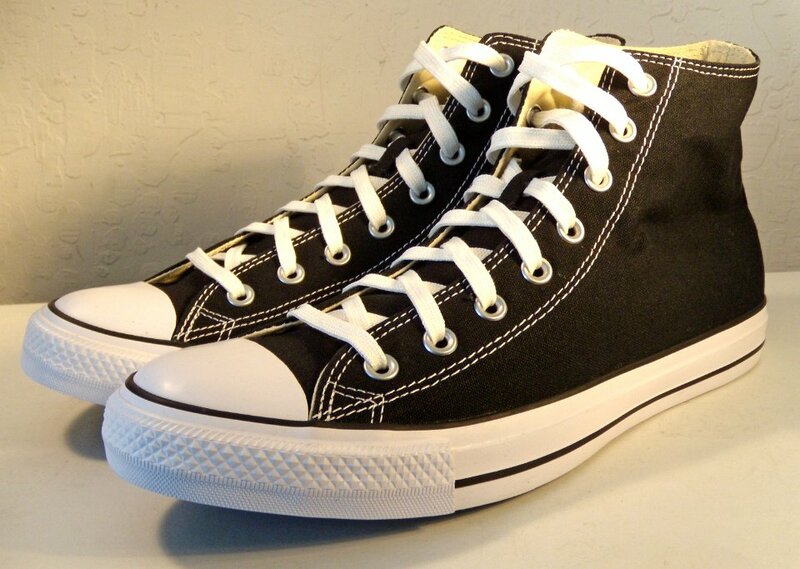 4 2018 Black High Top Chucks Inside patch view of the black left high top. 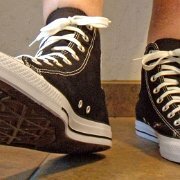 5 2018 Black High Top Chucks Rear view of the black high tops. 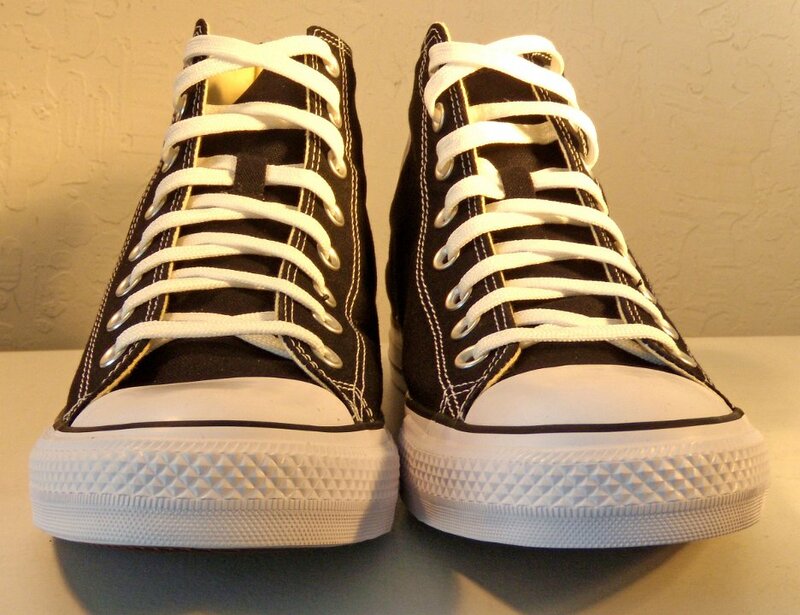 6 2018 Black High Top Chucks Angled rear view of the black high tops. 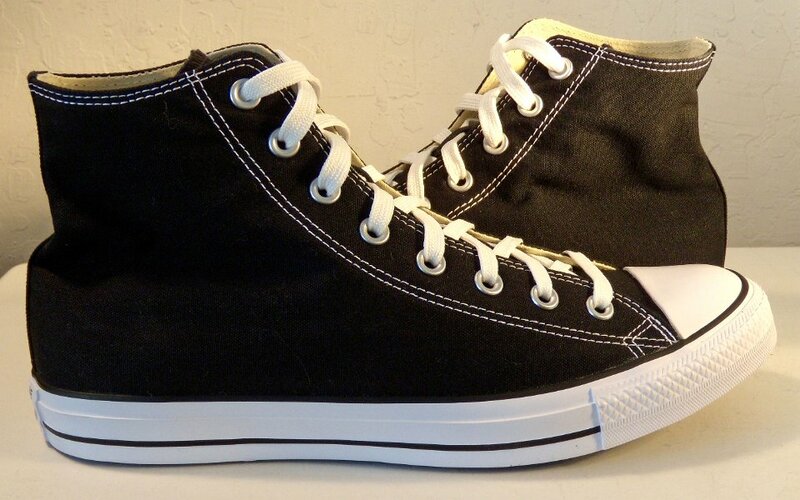 7 2018 Black High Top Chucks Angled side view of the black high tops. 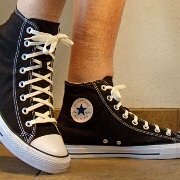 8 2018 Black High Top Chucks Front view of the black high tops. 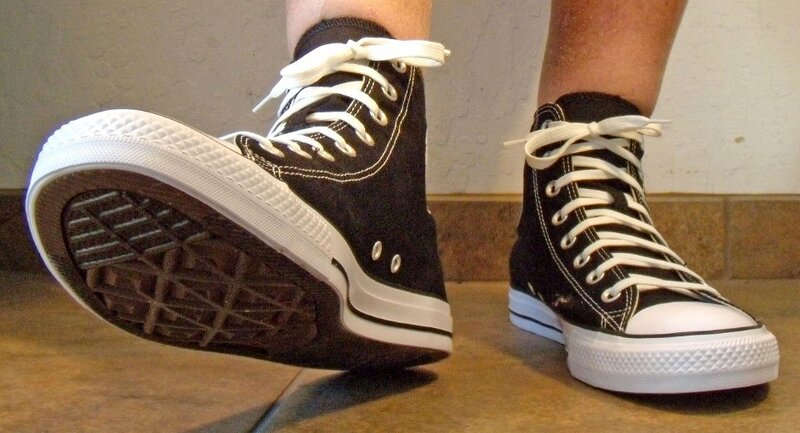 9 2018 Black High Top Chucks Angled front view of the black high tops. 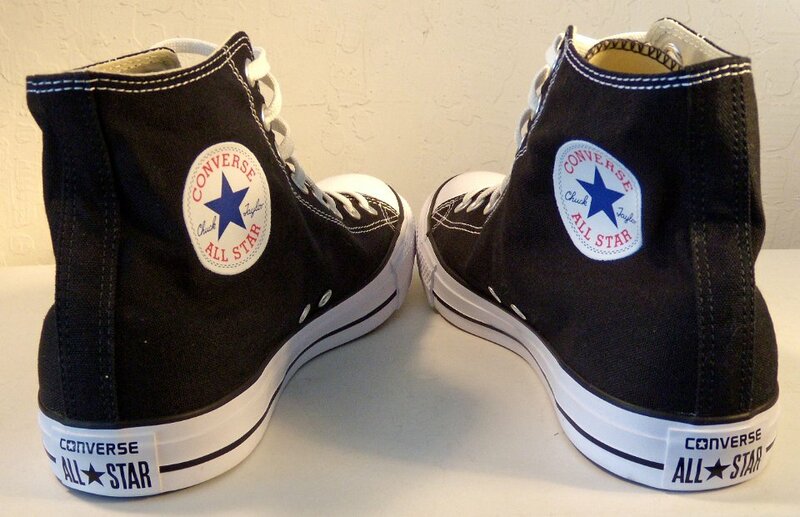 10 2018 Black High Top Chucks Top view of the black high tops. 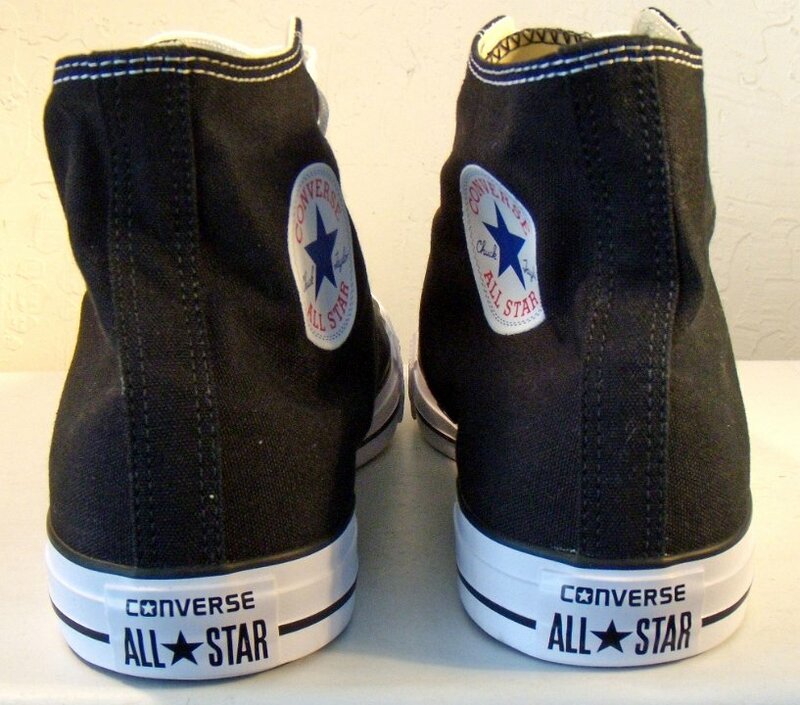 11 2018 Black High Top Chucks Inside patch views of the black high tops. 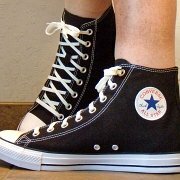 12 2018 Black High Top Chucks Outside views of the black high tops. 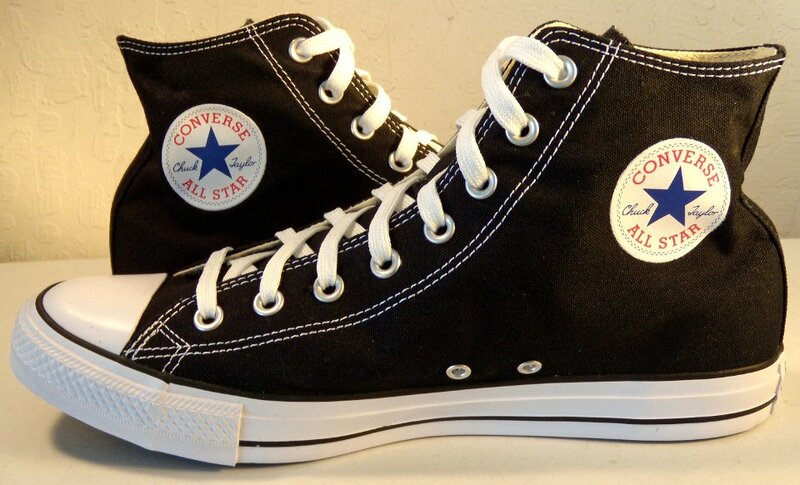 13 2018 Black High Top Chucks Inside patch and sole views of the black high tops. 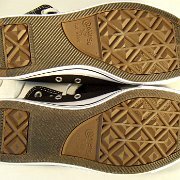 14 2018 Black High Top Chucks Insole closeup view. 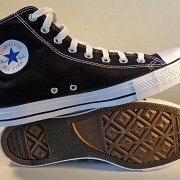 15 2018 Black High Top Chucks Outer sole views. 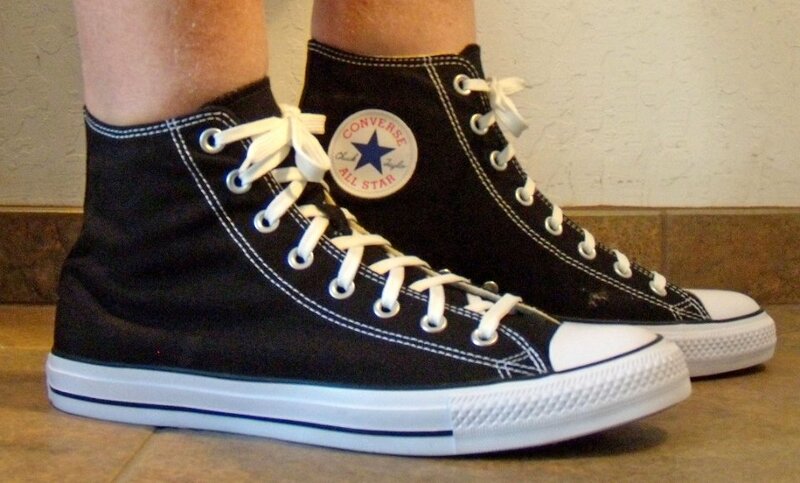 16 2018 Black High Top Chucks Wearing black high tops, front view 1. 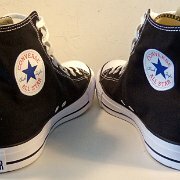 17 2018 Black High Top Chucks Wearing black high tops, front view 2. 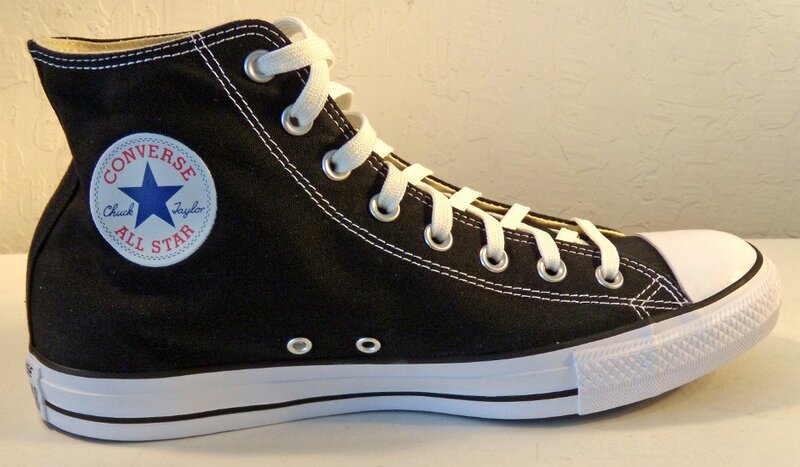 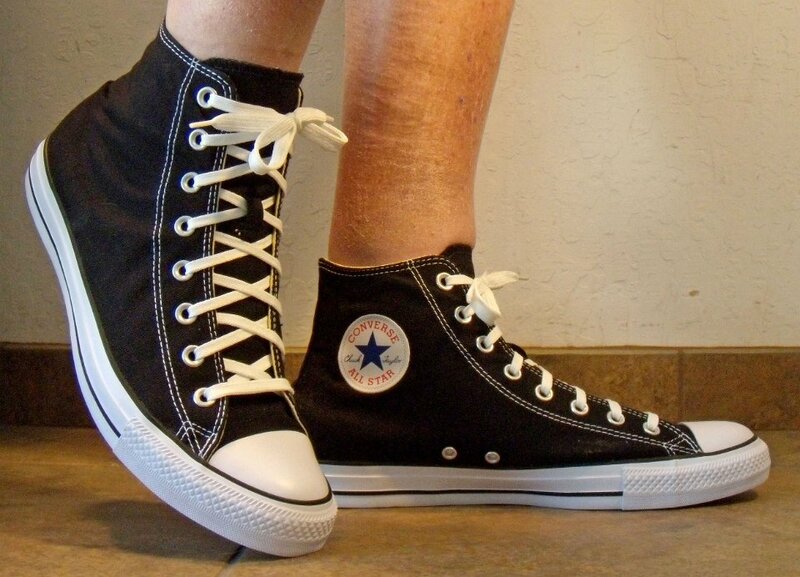 18 2018 Black High Top Chucks Wearing black high tops, left side view 1. 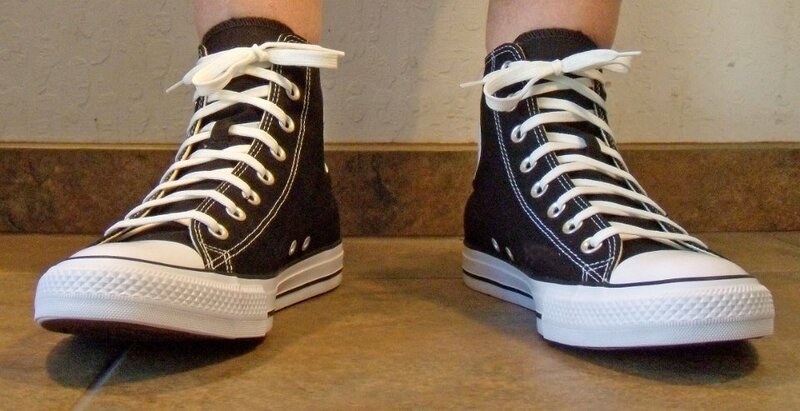 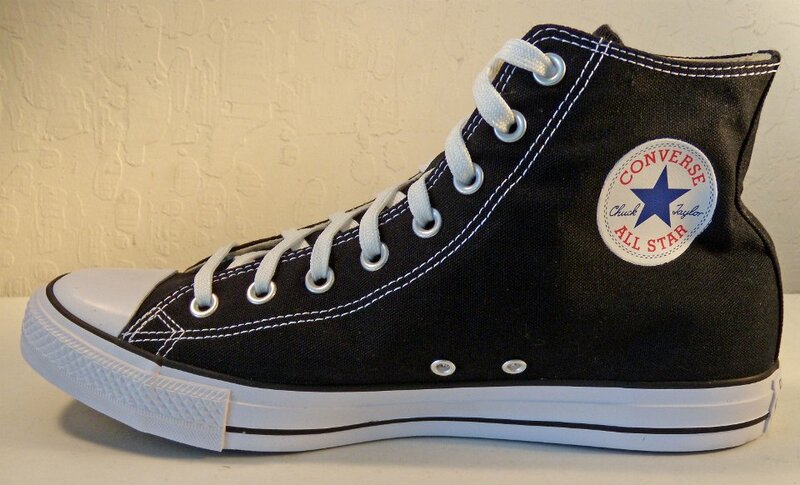 19 2018 Black High Top Chucks Wearing black high tops, left side view 2. 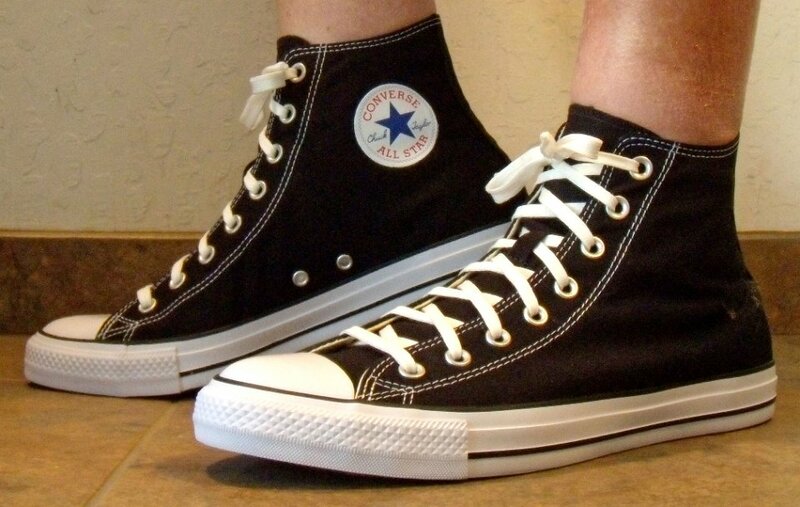 20 2018 Black High Top Chucks Wearing black high tops, rear view 1. 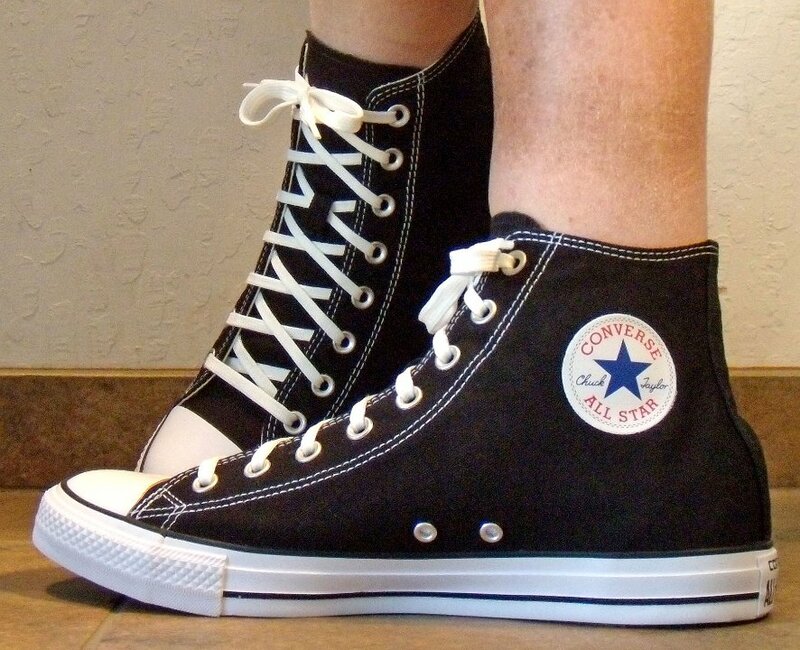 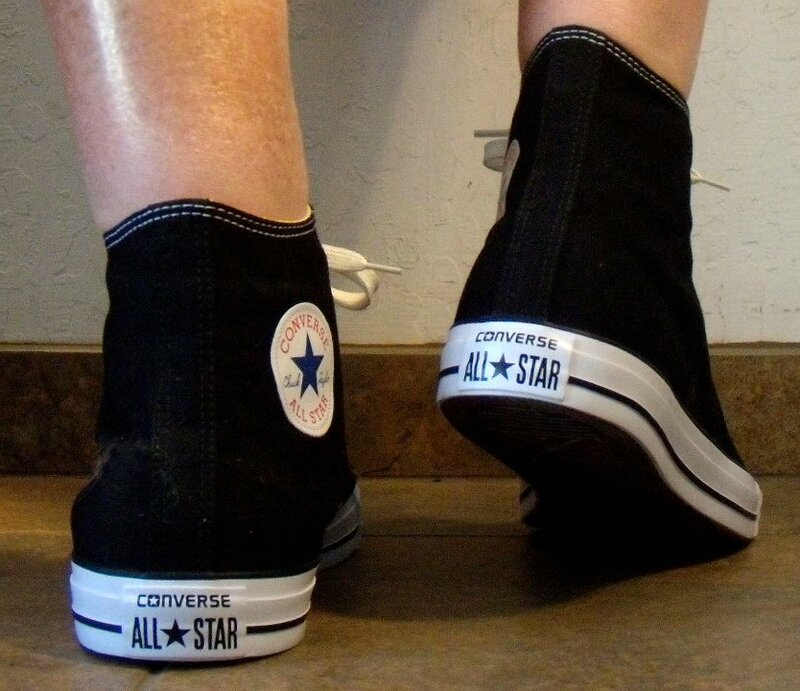 21 2018 Black High Top Chucks Wearing black high tops, rear view 2. 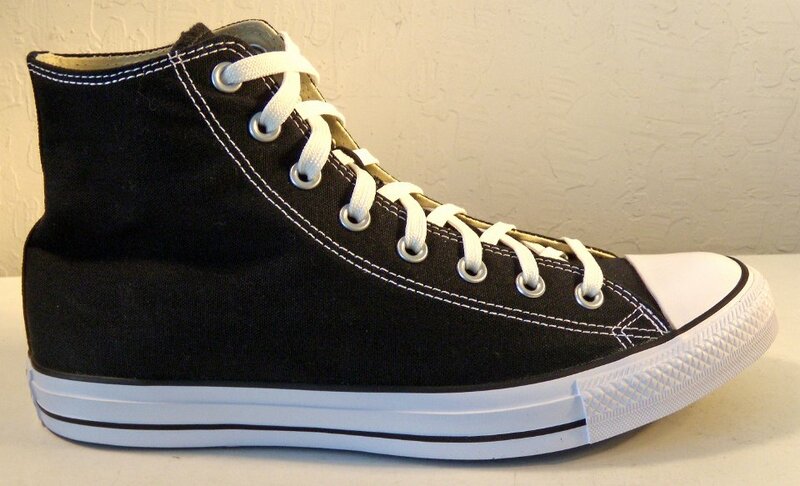 22 2018 Black High Top Chucks Wearing black high tops, right side view 1. 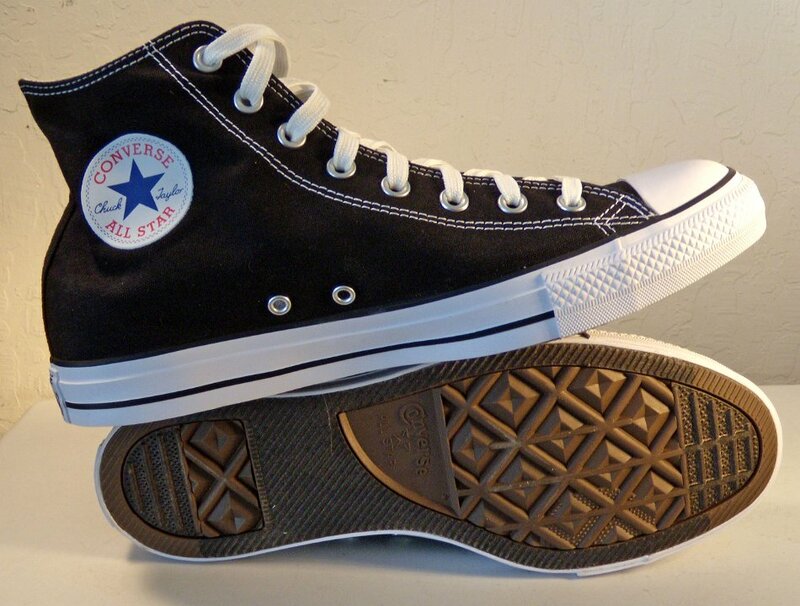 23 2018 Black High Top Chucks Wearing black high tops, right side view 2. 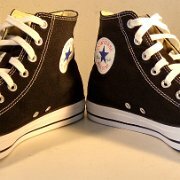 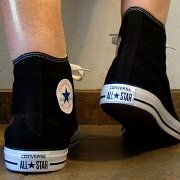 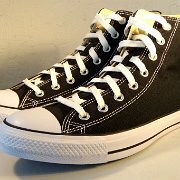 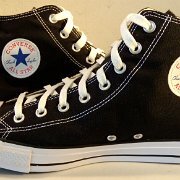 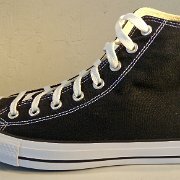 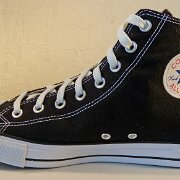 Black Converse All Star Chuck Taylor canvas high top basketball shoes are the classic American sneaker. 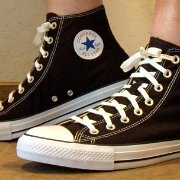 They have been a consistently popular since their introduction in 1948. 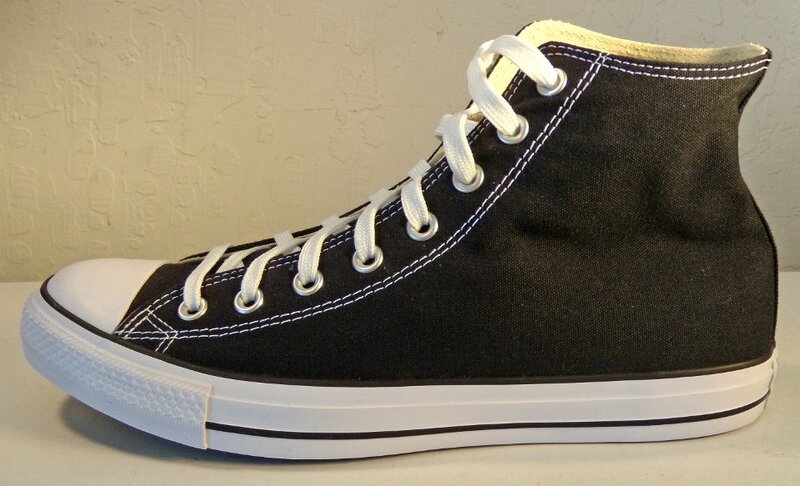 This 2018 pair, a core model in the Chuck Taylor line of sneakers, still is very similar to the chucks issued 70 years ago. 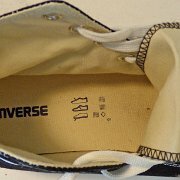 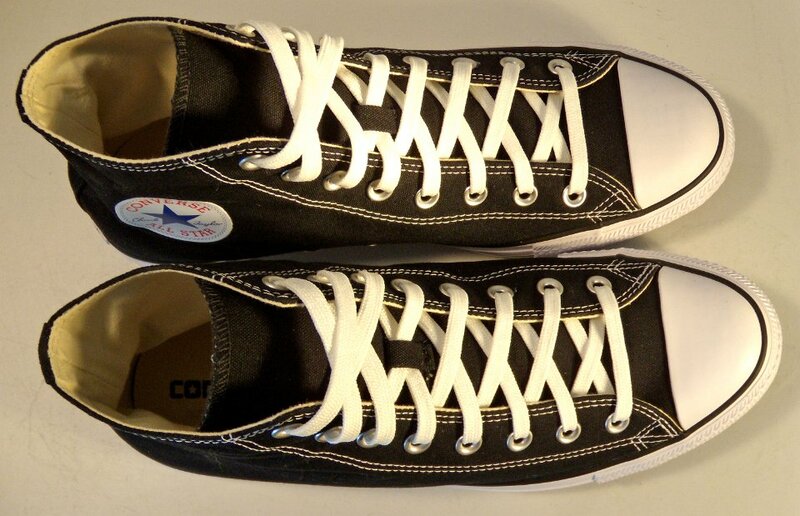 For example, the stitching on the ankle piece is black not white, while the rest of the stitching is white, one of the differences between core models of chucks and seasonal models. 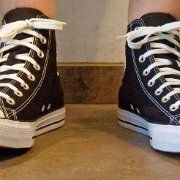 All the newer models of chucks now include the slit on the tongue for shoelaces between the sixth pair of eyelets, which holds the tongue in place and makes it easier to lace and unlace the shoes. 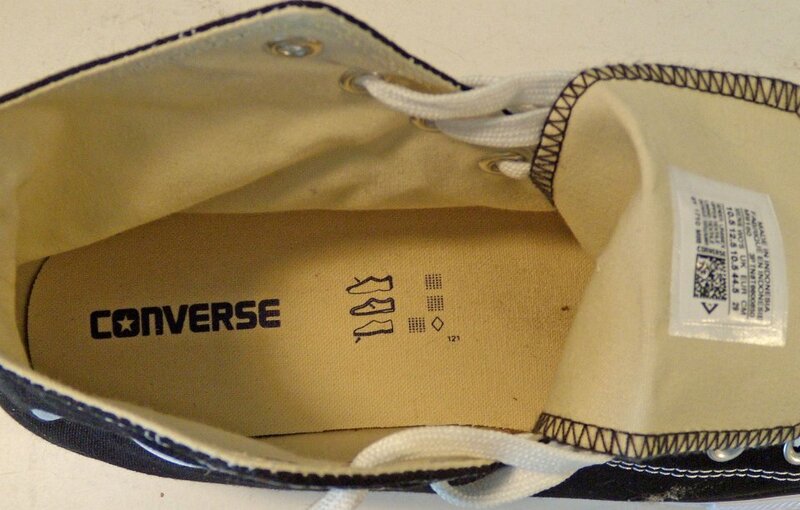 This is one addition to the original design. 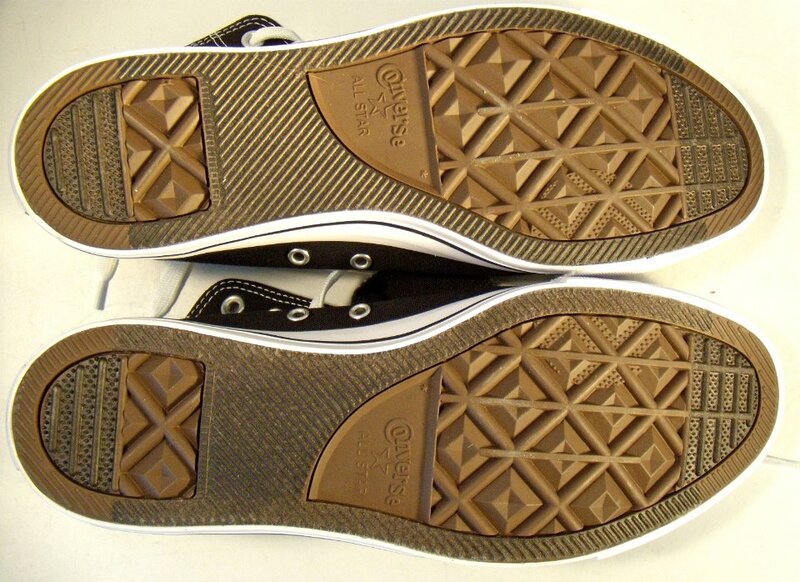 The only other big change has been the different heel patches over the years. 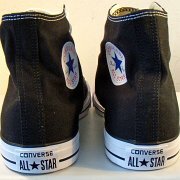 Now they come with black on white heel patches that say Converse All Star. 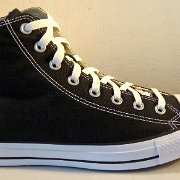 Black high tops still have natural inside canvas, black racing stripes, the standard red white and blue ankle patches, and white foxing and toecaps. 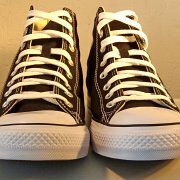 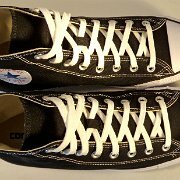 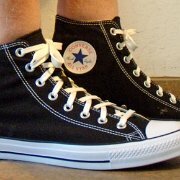 These chucks are shown with ChucksConnection classic 54 inch shoelaces.